Our Classic Party Package (DRY) includes: 1 18' Super Slide (DRY), 1 Stadium Bounce House and a Cotton Candy Machine (Supplies for 40 servings). With a colorful red, green, purple and yellow theme, this dry slide and bounce house will match any theme or décor, and be an eye-catching attraction. 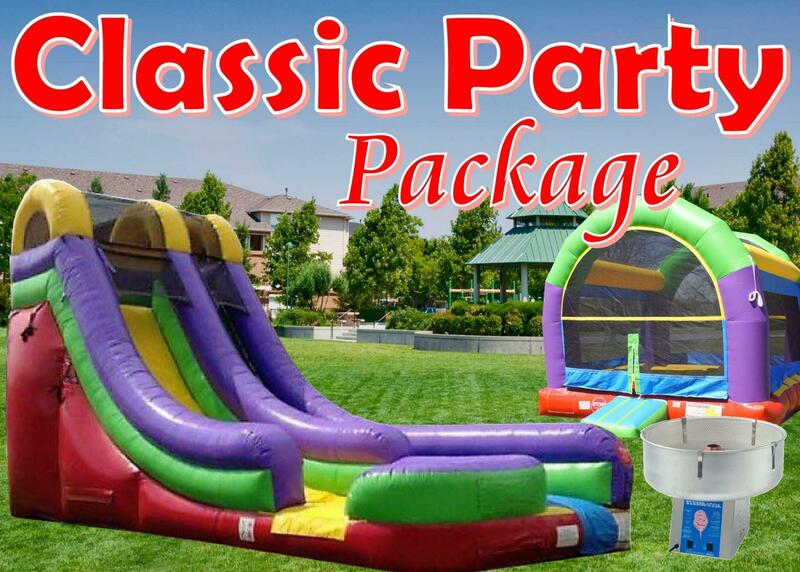 Participants can climb up the inflatable slide for a sleek and fast drop to the cushioned bottom, or bounce around the beautiful and singular designed bouncer, guaranteed to satisfy thrill seekers young and old. If you reserve this package, you'll be saving $25.00 and will also get FREE setup.